MORGANTOWN, W.Va. - Marshall Football opened the 2011 season with arguably its most unique contest in school history Sunday when its Coal Bowl matchup with West Virginia was declared finished at 10:24 p.m. ET with 14:36 remaining on the fourth-quarter game clock and the Mountaineers leading 34-13. The game was ended after a mutual decision agreed upon by the Athletic Directors of both schools - Marshall's Mike Hamrick and West Virginia's Oliver Luck. The decision to end the competition was reached after consultation with the offices of the commissioner of both Conference USA and the Big East Conference, as well as the medical staffs of both schools and was based on the pending weather forecast and the physical and mental fatigue of the student athletes on both sidelines. The contest, which was the season-opener for both schools and sponsored as the "Friends of Coal Bowl," began at 3:30 p.m. ET and was broadcast nationally on ESPN. At 5:48 p.m. ET, with four minutes and 59 seconds remaining in the third quarter, the game was stopped because of lightning and heavy rains in the area. A three-hour and three-minute delay ensued, during which multiple lightning strikes could be seen in the area around the stadium and heavy rains drenched the playing surface and flooded low-lying areas around the stadium. The two teams were able to play the final five minutes of the third quarter and saw just 24 seconds tick off of the clock in the fourth before a second weather-related delay was announced at 9:06 p.m. The teams did not return to the field prior to the official game-ending announcement more than an hour later. On the field, it was a 17-point second quarter that proved the difference. Marshall lit up the scoreboard first, thanks to spectacular special teams play. After forcing the host Mountaineers into a three-and-out situation on their very first offensive drive of the game, Herd junior wide receiver Andre Booker returned the ensuing punt 87 yards to the WVU end zone. 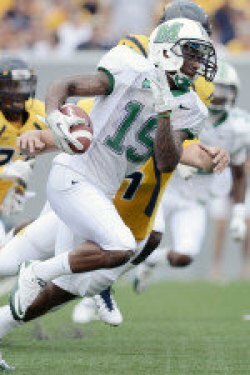 The score marked the first time a Marshall student-athlete had returned a punt for touchdown since the 2009 postseason, when Booker recorded a 58-yard return against Ohio in the Little Caesars Pizza Bowl. Herd senior kicker Tyler Warner completed the point-after attempt to give Marshall a 7-0 lead. On the ensuing possession, Mountaineer quarterback Geno Smith connected with Stedman Bailey for two big plays, totaling 43 yards to work West Virginia within kicker Tyler Bitancurt's range. Bitancurt put the Mountaineers on the scoreboard with a successful 27-yard attempt. After Booker's punt return, the Mountaineers rattled off 20 unanswered points, due in large part to Smith's heroics on third-and-long several times during the contest. On six different instances in the second quarter, Smith and the Mountaineers faced third down and long yardage, but the junior playcaller was able to elude the Herd defense to either keep the drive alive or, in the instance of a 3rd and 9 situation from the Marshall 15 yard-line, connected with Bailey for a 15-yard touchdown strike. Marshall cut the lead to 10 before halftime as Warner connected on a field goal attempt from 24 yards out as time expired in the second quarter. Before the third-quarter delay, both teams tallied another score, with West Virginia picking up another touchdown on a 100-yard kickoff return by Tavon Austin and Warner's second field goal of the night for Marshall - this one from 21 yards. West Virginia notched its final score of the night - a one-yard touchdown run from Vernard Roberts during the short recommencement of play. Marshall's Darryl Roberts and Devin Arrington led the defensive unit, each tallying six tackles apiece. Effective against the run, the Herd finished the shortened contest with nine tackles for loss, pushing the Mountaineers back for a total of 32 yards. Defensive lineman Trevor Black accounted for 2.5 tackles for loss and Rashad Jackson was also responsible for 2.0 tackles for loss. Marshall freshman quarterback Rakeem Cato went 15-for-21 and 115 yards passing in his collegiate debut. Tron Martinez led the ground attack for Marshall, leading all rushers with 76 yards on 10 attempts. In addition to his first-quarter touchdown, Booker finished with 93 yards on four kickoff returns, accounting for a team-high 180 all-purpose yards for the contest. The Herd will host Southern Miss at 3:30 p.m. on Saturday in a game that will be televised on CSS (Comcast Sports Southeast). The Marshall Athletics Ticket Office WILL be open from 10 a.m.-4 p.m. ET Monday and can be reached at 1-800-THE-HERD. As always, fans may also purchase tickets 24 hours a day, seven days a week at HerdZone.com.